← Captains Roundtable Live Tonight! So part 2 of Massively’s coverage of the new fall content and F2P switch (Part 1) was posted this morning and it covers both the new festival and the store. The haunted cellar sounds really cool and very fall-like I’m actually quite intrigued about not only how it will look but the themed decorations that will be available with the token rewards 🙂 Hopefully they’ll use the fear logic from BG such that you can be feared and randomly run around and trigger more fun! The meat of what I wanted to write about was the info on the store. Now I realize this is all subject to change as we’re still in the beta, but I’m sure there will be LOTS of upset folks over the addition of items to reduce the in-game grind. In certain cases I’m all for it, but I see them handling it two separate ways, one I like and the other I don’t. Now the part I don’t like is the ability to purchase reputation mounts as I think this is taking the above concept a step to far. I’m all for using the store to buy mounts as long as it isn’t your first one but I don’t like the idea of removing the reward for the reputation grind many (like me) have completed. I think those mounts should only be available if you have the appropriate reputation. What I would like to see is similar to the traits discussed above, a buff that grants double reputation for a period of time such that you could more quickly accomplish your goals. Another option would be to allow purchasable reputation which would mimic my thoughts on Virtues, which if done properly I could support as well. Now this may only be showing the mounts available for that character, but I see no clarification and as such I’m purely posting on what I would have a problem with if it stays like this through beta. And even if the system does work like this currently, there’s still lots of time for them to flesh out the details and make changes based on the community feedback. I will update this post as I’m sure there will be some dev clarification on these topics based on the feedback from the community, this thread on the F2P boards seems most likely to be the one to kick up some dirt but I’m expecting more as the day goes on. 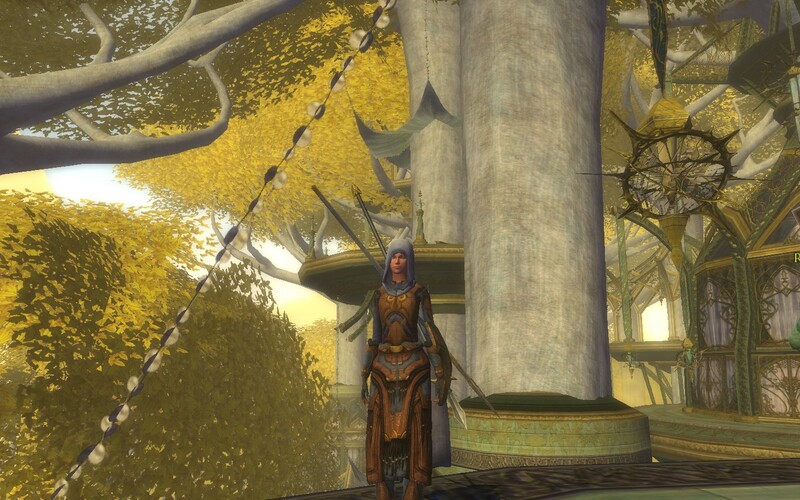 This entry was posted in LOTRO and tagged Expansion, festival, Free to Play, LOTRO, reputation, traits, virtues. Bookmark the permalink. I must admit that I agree with you regarding the reputation mounts. I appreciate that F2P mean accommodating all sorts of changes and compromises need to be made. However, when you’ve spend ages grinding your rep, your steed is a reward and a badge of honour. To then make something like that available to purchase kind of “rains on your parade”. If they made the purchasable mounts subtly different, say by adding a “Sponsored by Turbine” message on the side, then I think this would be a satisfactory settlement for all parties. I’m really not sure on this one, I’m pretty torn but I think it will be interesting to see the reaction. If the prices are correct, I’m not too worried. It costs 3 months worth of free points (@500/month) to get them – not as quickly as I could probably grind that out in game – and it frees that playtime up for something more productive. It doesn’t grant me any other rep benefits (as far as we know so far…) so I’d still need to grind up in game to get anything else. In other words, I don’t think there is a diminishing of respect for players likely to occur and those who play vs those who pay their way to rep mounts have what matters to them – the satisfaction of accomplishment. Those who pay get to have what matters to them – sparkle ponies. I guess maybe what’s bothering me more is that reputation (outside of Lorien and Mirkwood because of the crafting) is completely worthless with this change as I agree with most of what you wrote. As for the first question, this is essentially buying in-game gold – or 5 gold for 1495 points, which is roughly 300 points per gold. Still pretty steep don’t get me wrong but it still is using real dollars for in-game currency. I agree that it is a way to bypass the grind, which does have me a little concerned considering many grind reputation purely for the horses and cosmetics. Not to mention this isn’t speeding up the grind, this is flat out skipping it. I guess this is just an old player feeling upset that I could just buy the items I care about as opposed to working in-game. I agree with you Doc about reputation horses. I think your idea for being able to purchase a way to double your rep points for each rep item turn-in or some such is a good idea. 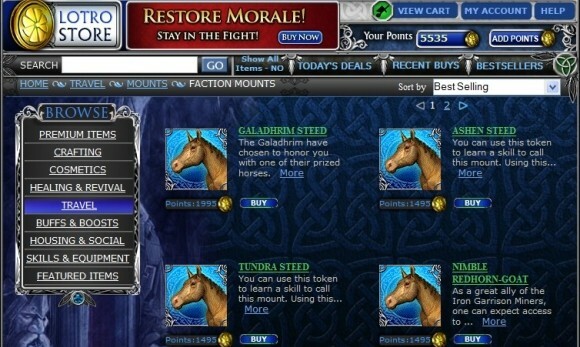 Also, I’m hoping that if they do decide to keep reputation horses purchaseable through Turbine Points, maybe they will atleast keep the hardest ones not purchaseable, such as the Dunedain War Steed for example, so that there is atleast something out there that has to be earned rather than bought. Lastly, I was pleased to see the prices they had for the expansions, roughly 1900 Turbine Points for the Moria Expansion and about 1500 for the Mirkwood Expansion. While I won’t need to purchase these 2 expansions as I already have them, it does give an idea of what the next expansion may cost and I think these are more than reasonable prices and is something that a VIP can easily save up their points for to get the next expansion for free. Now that you mention it, I think the expansion prices are even a tad high – that’s roughly 3-4 months @500 points which is approximatively $30-$40. Now granted, we don’t know how much it will be for buying TP I’m just going off subscription prices but I think whatever the amount is should be around $20 for small expansions (Mirkwood) and $30 for a full one (Moria). I see your point there Doc, but I don’t think you can just look at it as paying the full subscription price for your Turbine Points. I pay the subscription because I want full access to the game (and for that matter don’t really even pay the subscription as I’m a lifetime member). Without F2P I would not be getting Turbine Points and would have to pony up cash for any expansions. With the monthly allotment of Turbine Points I can now choose to save them up if I prefer and essentially get the expansion for free. I’ll have something on the order of 3500 Turbine Points already when F2P comes out so can easily spend some and still have enough for the expansion when it comes out. Seems like a good deal to me. That’s true, I’m just going by the only metric we have currently. Once they release the cost for Turbine points we’ll have a better handle on it. I’m hoping 1000 points is roughly $15-$20. Based on the DDO store pricing 1000 TP is worth $10 if you buy $50 worth of points. While they’re more expensive if you buy less points I think it’s a good baseline to evaluate the store prices. In that case expansions are worth $15-$20 (Mirkwood and Moria respectively) which are pretty much what we paid for when we bought them. Reputation horse come out at $15 and at that price I don’t really mind that people don’t have to grind the rep to get them. yeah, $15 is a bargain compared to the “sparkle pony,” I’m slowly coming around but something just isn’t sitting right with me on this one. I’m sure I’ll be fine with it as we go forward and more information comes out on it. I welcome fully reducing the virtue grind. I also agree with you about the rep mounts. You should still gave to earn the rep first. Yeah, I don’t mind the idea of the “sparkle pony” but making something that took in-game work purchasable is a bit troubling to me. Are they going to make the meta-deed horses purchasable too? Or the Moors horse?